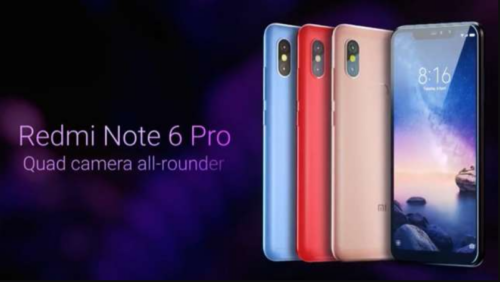 Xiaomi launched Redmi Note 6 Pro today i.e. 22 November in India at an event being held in New Delhi. It will be available for sale from tomorrow i.e. 23 November. Here are the details about the latest smartphone launched. Redmi Note 6 Pro features a 6.26-inches FHD+ 19:9 notched display with a screen resolution of 1080×2280 pixels. It is powered by octa-core Qualcomm Snapdragon 636 SoC, paired up with an Adreno 509 GPU. The successor of Note 5 Pro is packed up with 3GB/4GB RAM and 64GB internal storage along with 4000mAh battery. The smartphone measures 157.9mm x 76.4mm x 8.26mm and weighs 182g. It will be available in four colors; Black, Blue, Red, and Rose Gold. Redmi Note 6 Pro has four cameras; two rear and two front shooters. The rear camera supports 12-MP + 5-MP sensor and improved the f/1.9 aperture with features such as Single tone dual-LED flash, Dual Pixel Autofocus, Enhanced low-light photography, HDR, Panorama, Burst mode, Face recognition, and Dynamic Bokeh. Whereas, the dual front camera supports 20-MP + 2-MP sensors along with features such as AI Face Unlock, AI Portrait Selfie, AI Beautify, as well as AI Scene Detection. The connectivity options provided in the latest smartphone includes 4G VoLTE, Wi-Fi, Bluetooth v5.0, GPS, a Micro-USB port, and a 3.5mm headphone jack. Sensors onboard include the Rear fingerprint sensor, IR blaster, Gyroscope, Accelerometer, Distance sensor, Ambient light sensor, Electronic compass, and Hall effect sensor. The latest smartphone has been launched at two different prices for two different variants. 4GB RAM/ 64GB inbuilt storage variant is priced at Rs. 13,999 and 6GB RAM/64GB storage at Rs. 15,999. The Phone will go for sale tomorrow. Till then For Latest Tech News & Updates follow us on Facebook, Twitter, Instagram, and Youtube. Next articleRedmi Note 6 Pro Reviews: Why Is It Worth Buying?